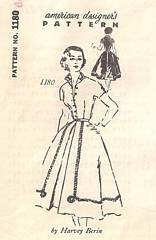 Vintage 1950's Spadea sewing pattern designed by Harvey Berin. Size 14; Bust 36.5; Waist 26.5; Hip 37.5. Pattern is unused and complete.